Board of Education chairman Betsy Hagerty-Ross, from left, Michael Harman and Sarah Zuro listen intently while Vicki Riccardo asks for an update on the special education audit. 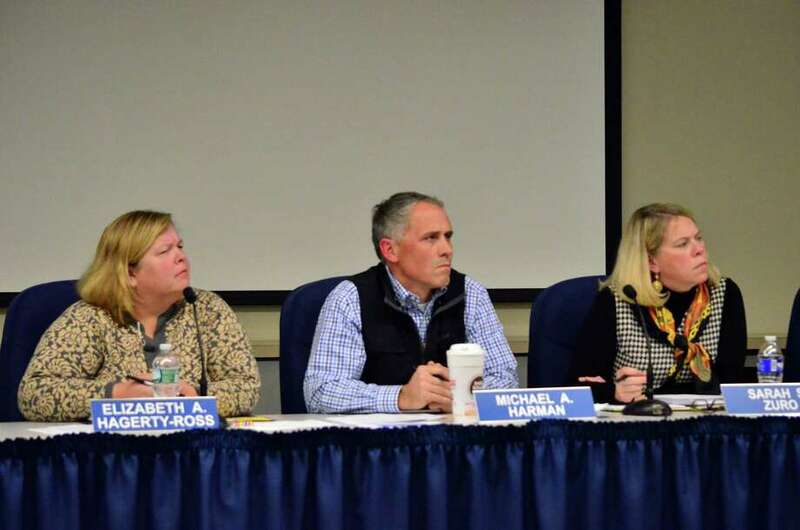 It's been almost a year since a special audit was commissioned to examine the Darien public schools' special education department and the results have yet to be made public, which proved to be an issue at Tuesday's Board of Education meeting. Vicki Riccardo, chairman of the Environmental Protection Commission, asked that discussion of the audit be added to Tuesday's agenda. Board of Education member Callie Sullivan made the motion, but none of the other nine members seconded it, leaving the motion to die on the table. "Heading into Election Day, voters need more information about the special audit," Riccardo said during public comment. "I know this board did not authorize the audit, but the audit is all about actions that are within your area of oversight. Frankly, I'm surprised the town leaders have not expressed more interest in the audit's progress. I doubt I'm the only voter who would like to know more now." Riccardo suggested that the Board of Education request an update from the Boards of Selectmen and Finance regarding the audit before noon Wednesday to meet the pre-election deadlines of the town newspapers. The are four candidates for three school board seats on the ballot in Tuesday's elections. According to Jon Zagrodzky, a Board of Finance member and audit committee chairman, there will be a presentation of the audit findings at 7:30 p.m. on Nov. 19 in the Town Hall auditorium. In October 2013, the Boards of Selectmen and Finance authorized a special audit following notice from attorney Sue Gamm, who was conducting an independent investigation into the special-education department, that there could potentially be an issue relating to the excess cost grants received from the state Department of Education. If the cost to educate a special education child is four-and-a-half times more than the cost of a general education student, the town is reimbursed by the state. The firm of CohnReznik was hired in November 2013 to do the audit. "Since then, sporadic progress reports have hinted at record-keeping deficiencies and other problems, but with the election upon us, we don't have answers for critical operations for which this board is ultimately responsible," Riccardo said. "Tonight, you have an opportunity to show your good faith to Darien's electorate." Board of Education Chairman Betsy Hagerty-Ross told Riccardo that the board had nothing to add because it had no information, but that the issue was discussed at a prior budget committee meeting. "Unfortunately, the Board of Education is the last to know because we have been asked to not be involved by the town," Hagerty-Ross said. "I have heard they are coming to conclusions soon." The completion of the audit has taken longer than anticipated, and in January, Zagrodzky and Board of Finance Chairman Liz Mao told the school board that CohnReznick had found numerous problems with procedures and practices with the grant application. In May, Zagrodzky said he hoped the audit would be completed by July. "We, too, want to know what else we need to change," Hagerty-Ross said. "We are waiting, as well as you are."